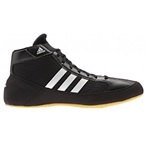 Although boxing boots aka boxing shoes are not as vital to training as boxing gloves would be, but you’ll notice a difference between wearing ordinary gym trainers and boxing boots. You’ll probably feel like your feet has better grip on the ground but at the same time light and mobile. I personally feel wearing boxing boots makes a big difference when skipping, wearing normal trainers just seems to make it more difficult to leave that little gap between the soles of your trainers and the ground for the rope to pass through. I always find myself hitting my feet a lot more with the rope when I try skipping in normal trainers but wearing boxing boots allows me to get in a good rhythm and flow. Some boxing gyms won’t allow you to step foot in the ring to spar or for other training exercises unless you have boxing boots, so if you’re thinking about joining a boxing gym then it’s worth investing in a pair. 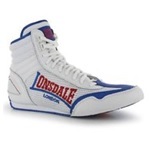 Boxing footwear is not just for boxing training, you can also wear them in the gym as opposed to gym trainers. Boxing boots are very useful for exercises such as squats and deadlifts as the shoes have a flat sole and excellent grip on the ground. 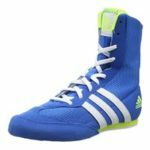 Cut – The first thing you’ll need to decide on is what you’ll be using them for, if you’re not going to be using them for competing or sparring then you probably wouldn’t need the high tops. 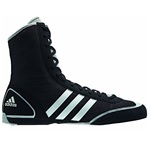 High top – The high top boxing boots will sit just below your calves, it’ll provide good ankle support but it may be slightly more difficult to manoeuvre around the ring. Mid cut – Medium cut offers both ankle support and it’s not as high up as the high tops enabling you to manoeuvre without feeling restricted. Low cut – Provides the least ankle support but allows you to freely manoeuvre. 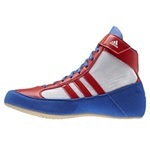 As these don’t look like obvious boxing shoes, you can also wear these as gym shoes. Size – On average the boxing shoes or boots will come up about half a size smaller so you should buy a pair slightly bigger than what you usually would. I had to buy a pair that was half a size bigger than my normal shoe size. Sole – The soles are either going to be rubber or suede or a combination of both. 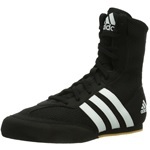 Suede will probably not sustain wear and tear as well as rubber soles, but some people may prefer suede soles when treading on canvas such as a boxing ring. 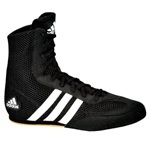 Closure – Most boxing boots are going to be lace up but some might be lace ups with a velcro strap. Having laces will allow you to make sure the boots are securely on your feet but will take more time to fasten whereas velcro boots will be quick and easy but may not be as secure. Footwork – As boxing boots have a flat sole usually made of rubber, this allows your feet to grip the floor a lot easier and you’re less likely to lose your footing and balance. 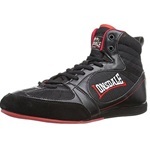 Boxing boots come in either low cut, mid cut or high top, the low cut seems to be the most common as this still provides support for your ankles and from a training perspective it seems to be more practical. 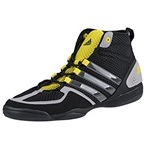 Lightweight – The fact that the boots are lightweight allows improved footwork. Having less weight on your feet also allows you to be quicker on your feet. 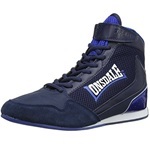 Can be used for other gym activities – Boxing boots can actually be used as an alternative to gym trainers, it’ll be more beneficial for certain exercises which requires a good grip on the ground.